When Bierstadt painted The Falls of Saint Anthony in his New York studio he aimed to convey the original grandeur of the location in a depiction that contains a veiled critique of the destruction of one of the most unique natural sites in the United States. Rather than offer an image of the Falls as they were in his own time, Bierstadt aimed to recreate their original beauty, using compositional devices traditional in landscape painting. A group of trees leads the eye into a panoramic view of the falls. Extending from the background, the evening light is magnified by the drops of water suspended in the atmosphere and bathes the forms in golden tones. In this sense Bierstadt’s work recalls Claude Lorraine’s compositions. 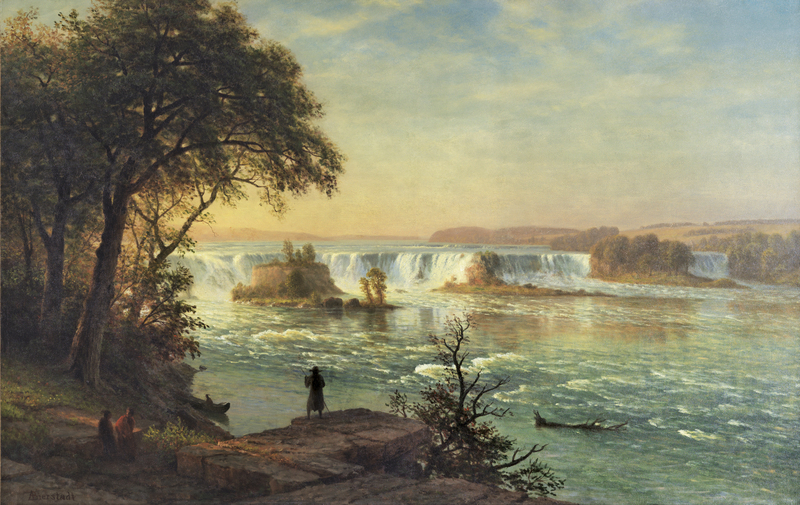 The emphasis placed on the Falls themselves, whose drop is in fact equal in size to Niagara, reflects the artist’s training in Germany. Bierstadt, however, considered the American landscape to be superior to that of Europe in its beauty and monumentality, expressing this notion through the grandeur of compositions such as the present one. Also innovative is the minutely detailed manner of depicting the vegetation in the foreground. It reflects the artist’s interest in botany, which he shared with painters such as Frederic Edwin Church. In the foreground Bierstadt depicts several Indians and a man with a stick seen from behind and wearing a hat. Recent research has suggested that this figure could be the Franciscan missionary Louis Hennepin who discovered the Falls in 1680. "But works of nature, the landmarks erected by the eternal elements; can these be obliterated? Have they any past which the artist can preserve for coming generations? Let this picture decide. Here are the Falls of St. Anthony, as they roared to an untenanted solitude in the year 1835, when George Catlin visited and sketched them. Who would recognize their identity between that fair wild scene and the Falls of St Anthony today." Painted only a few years before Matthews' lecture, Bierstadt's elegiac image of The Falls of St. Anthony reflects the same sense of lost wilderness and time. It is an imagined scene, of "fair wild" nature as Claudian arcadia, with its hazy golden light, conventional framing trees and pensive figures at the left. Unlike Catlin, Bierstadt saw the Falls long after the "untenanted" landscape had become memory. By the time he visited Minnesota in the 1880s, they were surrounded by the burgeoning city of Minneapolis. Their exaggerated scale here probably reflects the ambition of Bierstadt's instincts as well as memories of Niagara Falls which he first saw in 1869. It has been suggested that the solitary man in black standing on the rocky outcropping in the lower centre represents Father Hennepin, the Franciscan missionary who discovered the Falls and named them after St. Anthony of Padua while a captive of the Sioux in 1680. Bierstadt turned to the theme of discovery throughout his career, including his 1875 mural for the U.S. Capitol. Whether as interloper or as contemplative spectator, the presence of the figure in this painting is unresolved. As Novak observed: nature was "contemplated by the small meditating figures in these landscapes without much recognition either of nature's negative aspects or of the destructive potential of the 'culture' symbolised by [...] the figure of man himself."